It's finally happened. The ultimate driving machine has gone soft. Literally. The new F30 3 series is suddenly comfortable with genuinely assisted steering and ride that you could almost call plush. The old 3's hard edged suspension and heavy steering is history. So has BMW given into peer pressure and turned their scalpel sharp driver's car into a soft and squishy family mover? Or have they found that magical sweet spot of comfortable ride and spot on handling? But first let's address those new looks. At a quick glance, in profile at least, it's still very 3 Series. But take a closer look and you'll notice the car is now wider, higher and quite a bit longer. From the rear three quarters it almost looks like a 5 series, a perception aided by the new, very 5 series-like tail lamps. The big change is the aggressive new face. The long swooping bonnet has more than a hint of the Z4 in the design and BMW admits to taking a bit of inspiration from their open top roadster when penning the F30. What really captures attention are the new headlights. Now I admit I wasn't a fan of the protrusions that merge into the grille when I saw them in pictures. But it seems to work very well in the flesh. Like any self respecting BMW the LED corona ring are the centre of attention. However, they're now squared off instead of the normal round units. Besides that the car has subtle but chiseled lines and I particularly like the line that flows from the flared front wheel arch, through the door handles and merges perfectly into the boot. Add in the slight kink in the bootlid that forms a small spoiler and you have a dynamic looking car that still manages to avoid looking overtly flashy. Now the red car you see is the 328i (petrol) and in India we only get it in one trim, Sport line. BMW takes the word sport seriously and you won't find any chrome on this car. The front bumpers are largely the same on both the Sport line petrol and the Luxury line diesel save for the fog lamp housing. The diesel also uses a strip of chrome along the centre of the bottom lip in a novel way to add an air of sophistication. Chrome strips around the window line in the diesel stand in for matt black surrounds on the Sport line. The rear on both cars is identical except for the exhaust tips. The petrol gets a double barrel muffler tip and the diesel gets a single chrome exhaust tip. What really sets the petrol apart is the beautiful ten-spoke 18-inch rims that are only on offer on the 328i. The stark difference between luxury and sport continues on the inside. The Sport line interiors are primarily black with a dash of red on the dashboard and seats. BMW has also made smart use of grey lining on the pillars and roof to counter the naturally claustrophobic atmosphere an all black interior creates. The Luxury line diesel on the other hand has an identical interior in terms of layout but feels a world apart thanks to a beige colour scheme with some faux wood and chrome garnishing. Both cars come with a sunroof in case you start feeling a bit closed in. The actual layout of the interiors is still very BMW. Two stacks of buttons on the centre console keep things quite clutter free while the iDrive controller is between the driver and passenger next to the gear selector. There's also a traditional handbrake in keeping with the car's sporty aspirations. New to the 3 Series is the new tablet style widescreen display on the Sport and Luxury plus variants. The other variants use a smaller 6.5-inch screen. Also on the top two variants is a very nice sounding hi-fi audio system, a navigation system which actually works in India and a 12GB hard drive. In addition, the 328i has one trump card that none of the other models offer - heads up display. This HUD unit projects information like speed and navigation directions onto the windscreen. You can even adjust the height, angle and brightness of the HUD readout from the iDrive controller. All in all it's a very cool piece of kit. Now for the juicy bit. Drive the 3 Series and immediately two things strike you, especially if you've driven the old car. The steering is light and the suspension actually soaks most of the bumps on the road instead of letting your spine do the job. Ride quality is impressive even with the large 18-inch wheels on the 328i and BMW's insistence on using run flats on all variants. The old 3 was very nicely proportioned and was compact enough to be punted through traffic quite effectively. The new car has grown by a considerable 93mm in length but only people in the back seat are going to feel the difference. So how has the new suspension setup affected the 3's forte, handling? Well the new car turned out to be very impressive both on the road and on track when we drove it in Spain last December. However the car feels even further softened for India and that could be quite detrimental going around a corner fast. But in proper BMW fashion, it isn't. The F30 is still a sharp and entertaining rear wheel drive bundle of joy, just without the hard edge. The sharp steering weights up well as the speeds rise and gives you plenty of info from the front wheels. It is without doubt the best electronically assisted steering I've experienced yet. What's also interesting about the new 3 is that unlike other high end luxury cars it doesn't mask the sensation of high speed. That's not to say it gets uncomfortable or hairy at higher velocities. The car simply lets you know how fast you're going through the steering and seat of your pants. 150kmph and above in the 3 series feels exactly what it is - fast. Another major addition to the 3 is an 8-speed automatic box across all variants along with a stop-start system that like most works well but is best switched off in bumper to bumper traffic. Eight gears mean closer ratios and this box has a ratio ready for any situation. It's also great for high speed cruising. 170kmph in eighth has the engine spinning at just 3000rpm. It's a very smooth box and all variants also get a new Eco Pro mode that uses different accelerator maps and smart management of heavy energy consumers like the air-conditioning to reduce fuel consumption by up to a claimed twenty per cent. You can also drive in comfort or sport mode but unlike the Audis this doesn't affect suspension or steering settings but simply changes the throttle maps for sharper or smoother responses. You only get paddle shifters on the 328i but you can shift manually using the gear selector. The 8-speed torque convertor gets a Sport+ mode in the 328i and full bore shifts in this mode are accompanied by a small whack in the lower back that reminds you that you're driving a sporty car. The 320d uses the same engine as the earlier car but tweaked to offer one more PS and of course more efficiency. It retains the old engine's sweet, quick and free revving feel although it does get loud at high revs, loud enough to remind you you're driving a diesel. Which isn't a bad thing when you consider that you have a generous 380Nm of torque to play with from 1750 to 2750rpm. Power peaks at 184PS developed at 4000rpm. The 320d accelerated to 100kmph in 8.1 seconds, 0.3 seconds quicker than the old car despite testing in damp conditions. The car hit a top speed of 226kmph which is just about what the Germans claim. Most of the credit for the improved performance goes to the new gearbox but a bit of it also goes to the new electric steering and the kerb weight that's 40kg lower than before. Despite the impressive performance the 320d is still very efficient, good for 20.08kmpl on the highway and 13.1 in city driving conditions. The 328i is a replacement to the old 330i that came with a very sweet 3-litre straight six motor good for 258PS. The new engine is only a (turbo) four cylinder and it makes less power - 'only' 245PS. And that's the end of the bad news. The considerably smaller 2-litre motor uses a single twin scroll turbo, and it's not a twin turbo like the misleading Twin Power turbo moniker would have you believe. The turbo results in more torque, 350Nm to the old engine's 300. But what's remarkable about this engine is that it makes its peak torque lower and longer than the diesel. Consider this - you have 350Nm from 1250 to 4800rpm and 245PS from 5000 to 6500rpm. You're never out of the power band! Does it match the old 330i's performance. No, it simply demolishes it! 0-100kmph in 6.53 seconds. That's entry level sports car performance and the 328i can switch from being a calm city runabout to such ballistic pace at the drop of a hat. It's also very decently efficient, going 7.8kmpl in the city and 15.3kmpl at highway speeds. So there you have it, the F30 has been accepted exceedingly well worldwide and it makes perfect sense for India as well with a combination of added comfort, space and great engines. BMW seems to have further softened the car for India but the ride/handling package is still very pleasing and more importantly it still feels like a BMW. They've have got the pricing spot on as well. The all important diesel model starts at Rs 31.5 lakh (a cheaper variant will be launched later) and there's a range of variants to choose from. 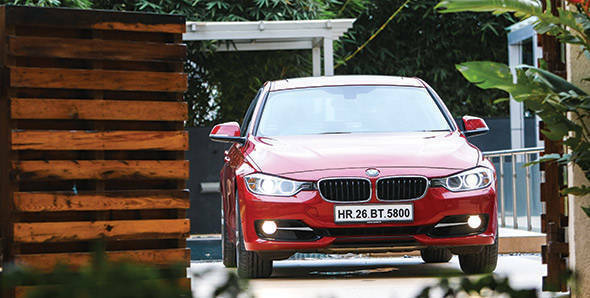 Rs 37.9 lakh for the bonkers 328i makes it one of today's best price to performance deals. BMW smartly offer the petrol in only the top spec sport trim -the majority of today's petrol customers in the segment are primarily looking for an involving car. Nine months ago we told you the new 3 Series would be worth waiting for. We love proving ourselves right.